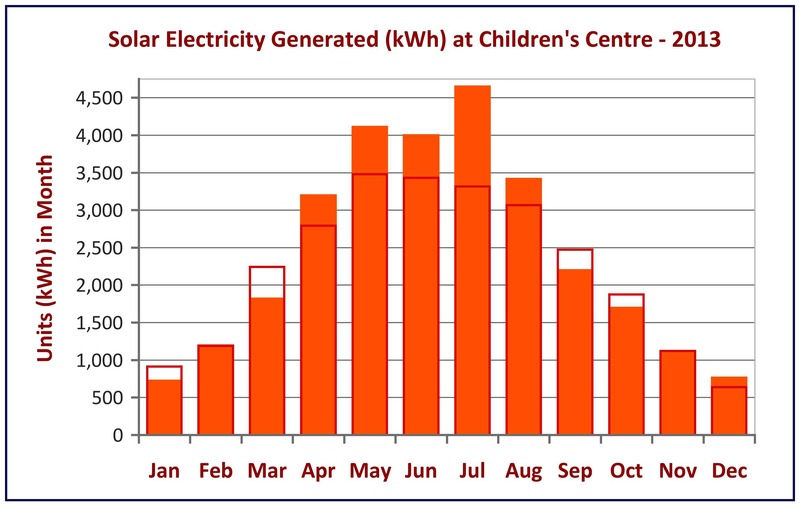 * Some generation lost in November 2017 due to panels being switched off while electrical works undertaken at nursery. 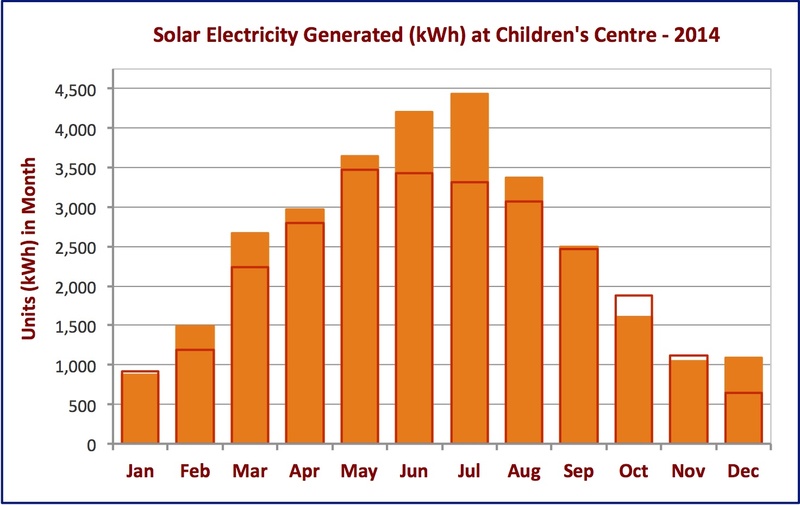 The charts below show solar generation each month (solid orange columns). 2014 was the best year yet for solar generation, with performance above forecast (red outlines) most months. 2015 was the best first half of the year so far, with solar output in April 2015 in particularly well above forecast, but the second half of the year was not quite so good. Selected daily performance charts can also be viewed below, which show output during the day and with changing cloud cover, as well as for the best generation days we have recorded. 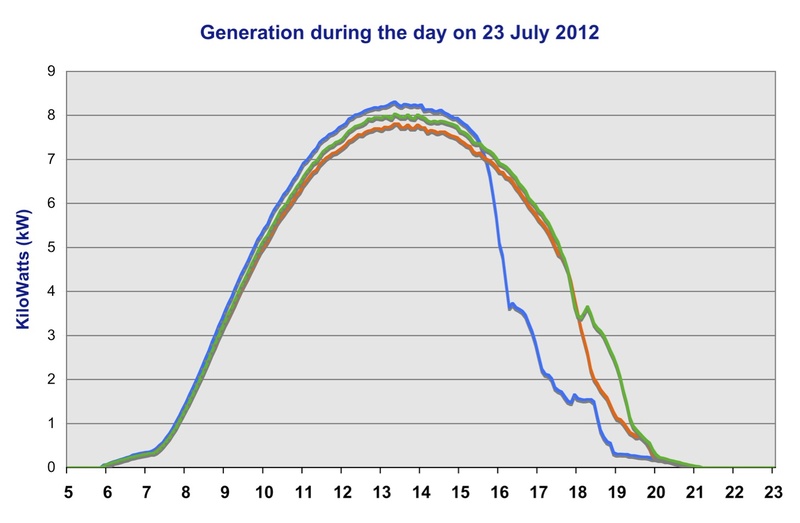 The chart below shows electricity generation on one of our best days so far in July 2012, when 191 units (kWh) were generated in a single day. The three lines show the power recorded through each of the three inverters, which are fed from three sets of panels on the roof. Generation started at about 6am and continued to 9pm (21:00). It can be noticed that the inverter with the blue line has a reduced power output during the afternoon, as does the orange line inverter to a lesser extent. This is due to late afternoon shading from a tree alongside the centre, but the effect is more minor than might be suggested, as this chart shows output on a very sunny day when the shading loss would be at it’s greatest. The shading does not occur throughout the year and on cloudy days the loss is reduced as the daylight is more scattered and shadows less strong. Over the year, we estimate the total loss as being 300-500 units. Overall the performance of the panels is above forecast and the minor shading, which was expected, is not a cause for concern. The charts below show other interesting daily outputs – click to view as a slideshow of full size images with captions. This chart, also from July 2012, shows how output can be affected on days with passing cloud cover. 133 units were still generated on this day. This chart shows how output varies with the seasons, as this is from a sunny day in December 2012, when 77 units were generated. This is just above the daily average (mean) of 74 units per day throughout the year. 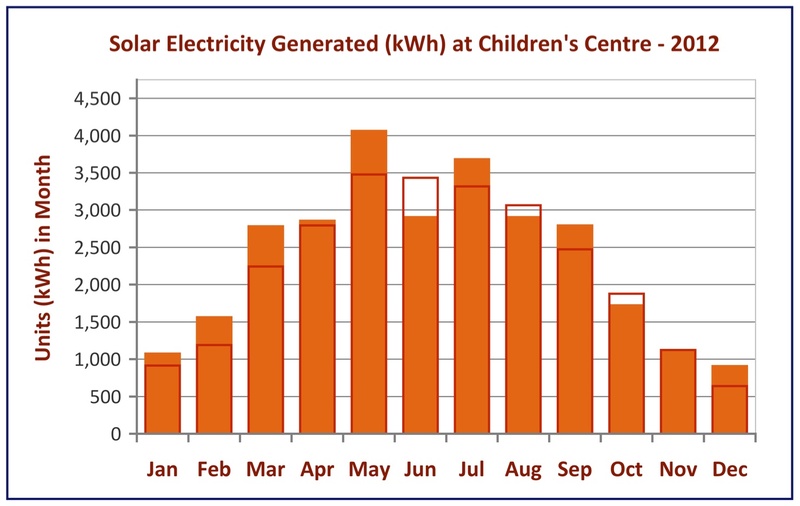 In the 12-month period up to May 2013, there were only 12 days when less than 5 units were generated. Overall, there were 133 days when output was under 50 units, 119 days with 50-100 units generated and 113 days with over 100 units. The best output in a day up to the end of June 2013 was on 8 June 2013, when 203.2 units were generated.